My father had an announcement to make. Looking sheepishly at my mother and I, he said: "For three times a week, I will be away most of the day with someone else. With another woman." Pausing dramatically, relishing the shocked look on our faces, he laughs before saying: "Don't worry, there is no other woman. Just a machine. I have kidney failure. Both my kidneys have stopped working." At that moment, I wished the other woman scenario was true. After three decades living with diabetes, it had finally taken its toll on his kidneys. High rates of diabetes and hypertension are major causes of kidney failure. 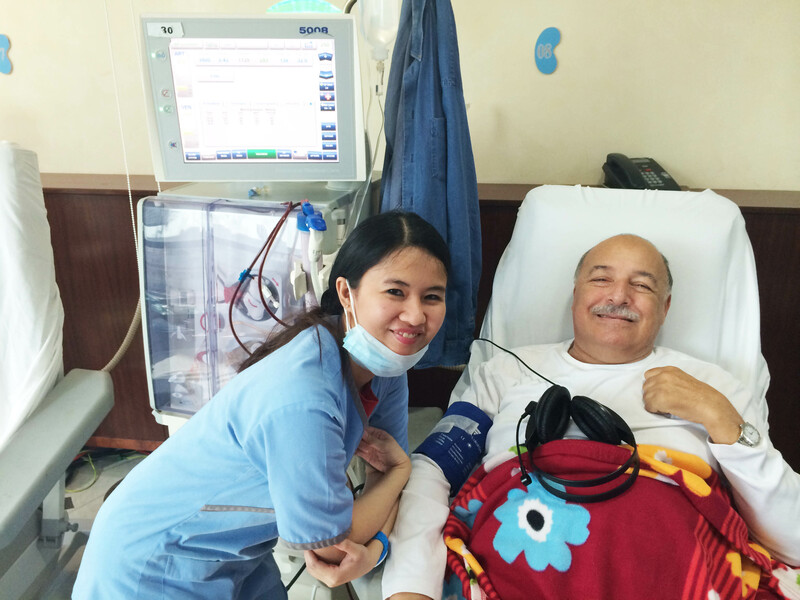 Dad during a dialysis session, with sweet nurse Mary. He isn't the only one: One in four of my sample of friends have at least one parent who is diabetic, and one in five has had kidney failure. Could be just a coincidence, but then I read that the latest figures show for instance that 1 in 3 American adults is currently at risk for developing kidney disease. Kidney disease and failure is quite serious and widespread. Taking the U.S. as an example, in a 2014 article it stated that the national transplant list passed a milestone, where more than 100,000 people are waiting for kidneys. While it depends from case to case, in general, four to six hours a day, three times a week, patients with kidney failure are attached to a dialysis machine. Dialysis is the artificial process of eliminating waste (diffusion) and unwanted water (ultrafiltration) from the blood. A depressing topic for sure, but it is the hardest for those struggling with this reality, and many are. 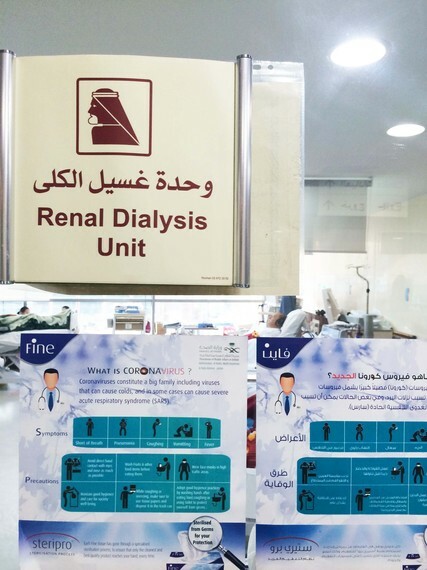 Studies have shown long-term dialysis is associated with early death and medical problems such as fluid imbalances, muscle cramps, bone diseases and infection. It also severely restricts quality of life, as patients need to always be close to a dialysis centre. People end up on a very long waiting list for a healthy kidney, and could end up waiting their whole lives and even dying before ever getting the new kidney they so desire. The illness pushes its victims to face up to very difficult facts. With my father in his 50s, he realized that he would be "low on the priority list" with children at the top. The older adults understand why, as one can say they have at least had a healthy existence for most of their life. At the time of their kidney failure, there is also the "hard talk" of who can donate from the family members, and the pressures that causes for everyone as there are always risks to both the patient and the donor. "I am not taking any of my children's kidney, I don't want to put them at any risk," my father announced. So he waits, like many many others, for a match from a dying or a deceased donor. At the clinic he goes to, he has formed new friends, and a whatsapp group named "kidney lovers" where each member discusses their day, their latest news such as "oh my friend is a match and I will be doing surgery" and the whole group congratulates and throw him a party. They have all become brothers, from different walks of life and nationalities. Sometimes, something goes wrong, and they lose a member. The support group is both a source of power and despair. Of course there are always those who prey on the vulnerable and the desperate. Illegal organ trafficking from poorer countries is on the rise. Some recent reports suggest that Syrians in refugee camps are offering their organs as a means of survival -- and there are those who are taking advantage of their desperate situation. Whenever there is a conflict, there are vultures nearby to take advantage of the refugees. While it can be an uncomfortable question to face, a decision to become a donor can save more than one life. In many countries they ask you if you want to become a donor when you are getting your driving license. I had said yes, as why should I let my organs decay and go to waste when they can give someone a new chance in life. Anyone who has a family member or a loved one with a chronic illness will understand that the illness, the waiting, and the frustration, does change the patient, and they do become irritable and sometimes unreasonable. Patience, love and great understanding is what is needed as it does get tough on everyone involved. There are always sacrifices. Whatever the case, I do hope they perfect "implantable artificial kidneys," which are still at an experimental stage, so that those waiting, like my father, can finally stop waiting and divorce the dialysis machine. "Hey, it can always be worse. This blanket could be pink!" says my father, pulling up a very colorful floral red and yellow blanket that helps keep the patients warm as often they get pretty cold during the process. No matter how difficult some days are, my father continues to smile and joke around with everyone around him. This post is in your honor, and all those struggling with illnesses but fight on with a great spirit and smile.